The Moonhouse Project by Mikael Genberg wants to put a little red Swedish-style house on the Moon. 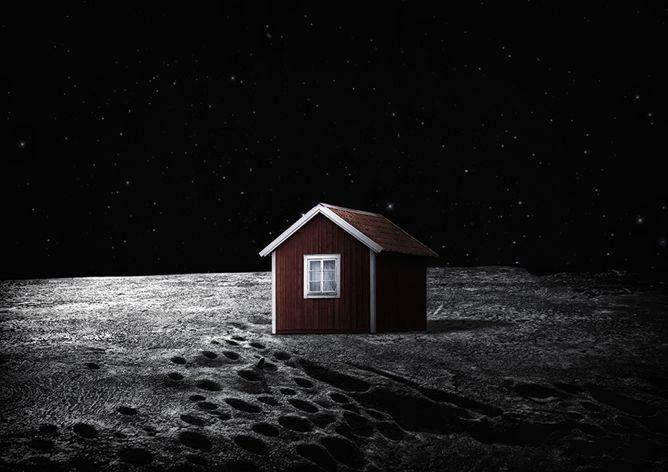 Will this Swedish cottage be the first house on the Moon? The Moonhouse Project aims to place a self-constructing house on the surface of the Moon in collaboration with American aerospace company Astrobotic. Genberg’s idea has been in development since 2003, and he is currently running an independent crowdfunding campaign (recent tally: funded $2,682.00 of its $15,360,000 goal with 185 days to go) to get it done in October of next year. The miniature house—which at just over 8-feet high, just under 10-feet wide and 6½-feet deep is just big enough to accommodate a grown human being—will be made from specially developed space-cloth stretched over a carbon structure. Attached to a spacecraft and deposited on the Moon, it will build itself by filling with gas, a process that will take less than 15 minutes. Because there is no wind on the Moon, the lightweight structure (22 pounds on Earth, 3.75 on the Moon) will be able to remain standing until further notice. The house will be painted in Falu red, the traditional deep Swedish red that contains natural pigments from the Falun mine and has been produced since 1764 by Falu Rödfärg (who are sponsors of the Moonhouse). The race to put a man on the Moon ended long ago. But will Sweden win the race to make an architectural mark in space? If the Moon belongs to everyone, I suppose an iconic little Swedish house crowdfunded by a global community has a place on the Moon. Nevertheless, I always assumed that if and when we started colonizing the Moon (and the rest of the universe), the architecture would be tailored to the possibilities of a brand new landscape, not a symbolic monument to the aesthetics of Planet Earth. *Correction, May 30, 2014: The post originally misspelled the last name of artist Mikael Genberg.